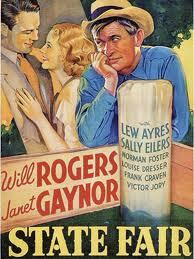 Every August around this time, the Will Rogers Ranch Foundation and California State Parks stage an outdoor screening of one of Will’s films. Last night it was the original version of State Fair (1933) directed by Henry King and starring Will and Janet Gaynor, with Lew Ayres and Sally Eilers. The Foundation called it “Movies in Will’s Back Yard”, as it took place on the putting green adjoining the Will Rogers Ranch. As Lew Ayres said about Will, he’s not really an actor at all: he’s just a character. He would never select a role that would call for anything but allowing him to be himself. The result was a series of great pictures made in the early 1930s before he died in an Alaska plane crash in 1935. My favorites are A Connecticut Yankee (1931), Doctor Bull (1933), Judge Priest (1934), Life Begins at Forty (1935), and Steamboat Round the Bend (1935). He was also America’s number one columnist. Somehow, he managed to pull off the neat trick of having both Republicans and Democrats love him. Now that Robin Williams is gone, who is there alive who can make that claim? The average citizen knows only too well that it makes no difference to him which side wins. He realizes that the Republican elephant and the Democratic donkey have come to resemble each other so closely that it is practically impossible to tell them apart; both of them make the same braying noise, and neither of them ever says anything. The only perceptible difference is that the elephant is somewhat the larger of the two.